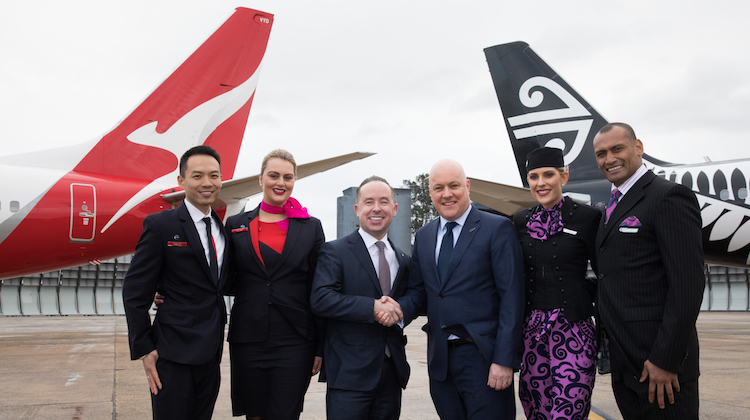 Not two months from casting aside Virgin Australia as its alliance partner in favour of going it alone on the Tasman, Air New Zealand has inked a codeshare deal with Qantas for ongoing access to Australian domestic destinations. 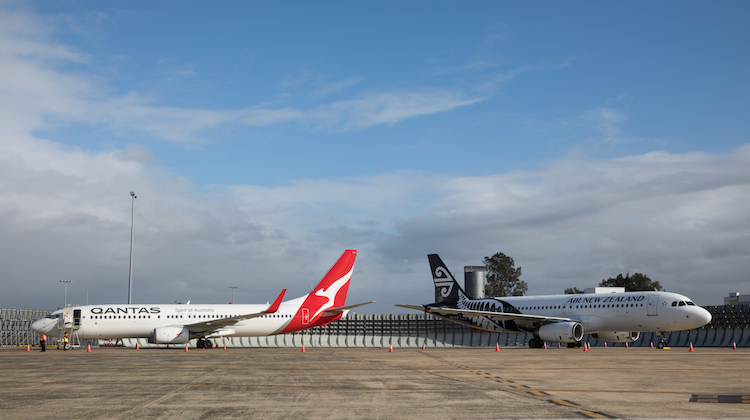 The codeshare agreement signed between the two carriers in Sydney on Friday features Air New Zealand adding its NZ airline code on 85 Qantas-operated domestic services in Australia and Qantas adding its QF code on 30 Air New Zealand-operated domestic services in New Zealand. There will also be reciprocal lounge access for eligible frequent flyers, with the agreement to come into effect in July for flights after October 28 2018, when the Air New Zealand-Virgin Australia alliance officially ends. There will be no codesharing or coordination on trans-Tasman services and the arrangement does not require regulator approval on either side of the Tasman. Qantas chief executive Alan Joyce noted Qantas and Air New Zealand had a long history together, pointing to periods in the past where the two airlines either had an alliance or held shares in each other. And while the two airlines would still be slugging it out across the Tasman and in other markets, Joyce said the arrangement was one that would benefit passengers and hence was worth entering into. “We are going to be continuing to be fierce competitors across the board but where it makes sense to work together to help our customers and help the customers of both airlines have a seamless, easy experience that’s something we want to do,” Joyce told media in Sydney on Friday. “Consumers will have a lot better travelling experience. They will have one ticket, they will have better connecting times of up to two hours improvement in the travel time. They will have the ability to connect bags through, the ability to earn frequent flyer points and access to the lounges. Qantas would continue to codeshare on its Jetstar-operated domestic flights in New Zealand. In early April, Air New Zealand announced it was walking away from its seven-year partnership with Virgin Australia that covered the trans-Tasman market. 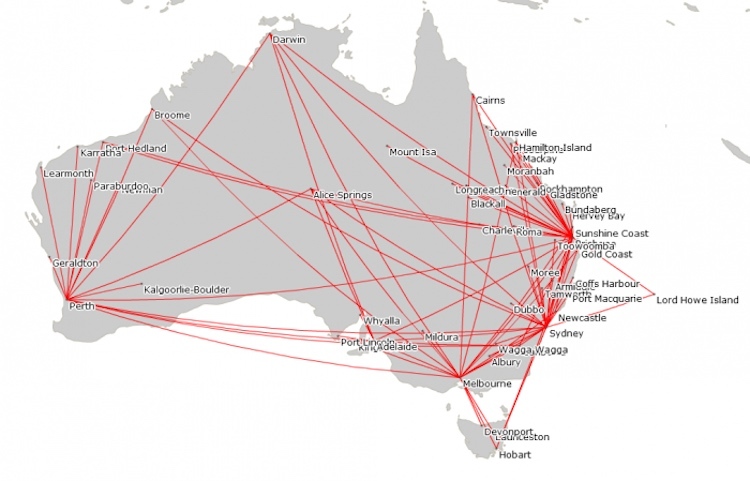 The tie-up included codesharing on each other’s trans-Tasman flights, as well on domestic services on each other’s networks, and reciprocal frequent flyer benefits. In explaining its decision to end the alliance, Air New Zealand said then the time was right for the airline to focus on its own objectives. Fast forward to a wet and windy Friday morning at Qantas’s Mascot Jetbase and Air New Zealand chief executive Christopher Luxon – standing alongside Joyce and with a Qantas Boeing 737-800 and an Air New Zealand Airbus A320 side-by-side in the background – was keen to highlight how this latest deal was win-win for both airlines and their trans-Tasman passengers. “We’ve got 140,000 of those customers now who can’t get to where they need to on a direct point-to-point destination so they need a connecting journey within Australia,” Luxon said. 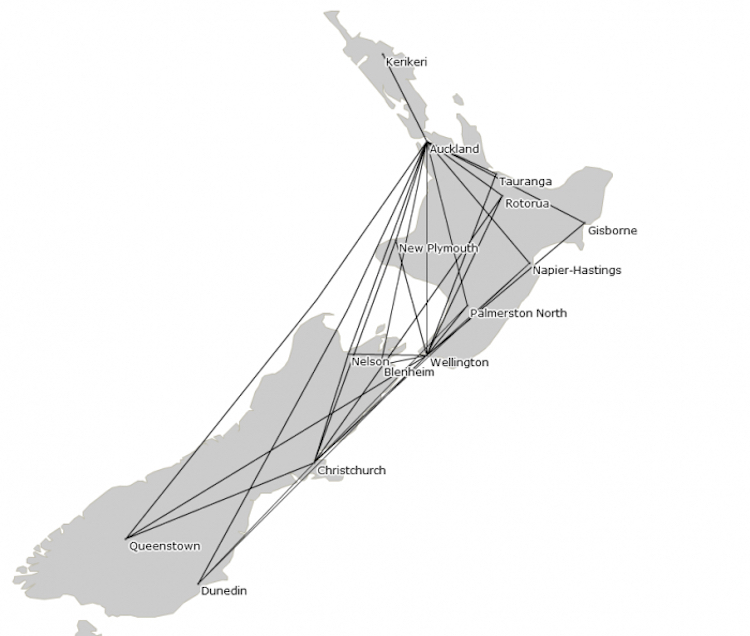 The codeshare agreement brings together the two largest operators on the Tasman. An analysis of figures from Australia’s Bureau of Infrastructure, Transport and Regional Economics (BITRE) shows Air New Zealand held 32.7 per cent market share for travel between Australia and New Zealand in calendar 2017, followed by Qantas on 18 per cent. Virgin Australia carried the third most passengers in calendar 2017 at 14.5 per cent, while Jetstar was fourth with 10.9 per cent. A host of fifth-freedom carriers such as China Airlines, LATAM and Singapore Airlines made up the rest. Luxon also talked up the good working relationship between the two carriers since they came together to draw up the codeshare agreement about six weeks ago. “It’s sort of a bit like high school, we are frenemies in some ways because we actually have to compete incredibly strongly and we will continue to do that but we will do that with great respect for each other but with tremendous rivalry,” he said. Virgin Australia described the codeshare agreement as “bad news for consumers”. “With the two major players in the New Zealand domestic market in partnership together, there’s no real competition in New Zealand and it is the consumer that will lose out,” a Virgin Australia spokesperson said in an emailed statement to Australian Aviation. “This will no doubt have flow on effects for competition on the Tasman, given only the two biggest players who have over 70 per cent of the market will be able to codeshare at each end. “We are surprised that a partnership between the two major airline groups in New Zealand is allowed. News reports in April had indicated Air New Zealand was open to discussions with Virgin Australia about codeshare or interline arrangements on domestic flights in Australia post the end of the alliance in October. Virgin Australia also flagged in April using its low-cost-carrier arm Tigerair Australia on trans-Tasman routes once its partnership with Air New Zealand concluded. Wonder how Virgin feels about this – bitter? At least this could mean Qantas Frequent Flyers enjoying some L&P in the Air New Zealand lounge, I hope. Awesome news. Now I can Fly on a QF code on Air New Zealand in NZ, and get status credits and FF points. This was predictable and afraid Virgin has no one to blame but themselves… I am aware that Air NZ had terrible problems getting them to take passengers when Air NZ had disruptions, Virgin want to be an airline but don’t want to play by standard industry rules… unless THEY have a problem then they’d expect Air NZ to jump through hoops. Have heard and seen stories of disrupted Air NZ passengers being sent back and forth between NZ and VA while VA argue over paperwork… was even told by an Air NZ (fairly senior) person once, we just send them to Qantas… it’s much easier. Qantas take the stub of the boarding pass or similar and then we do the paperwork later – that way if they divert a Sydney flight to Melbourne, the passengers are on a Qantas flight to Sydney with their baggage within an hour or two and not sent back and forth between terminals and Virgin and Air NZ offices. On top of that, Air NZ as a shareholder constantly sending money across the ditch to prop up Virgin… no wonder it’s happened. When, oh WHEN, will shareholders get the news that Virgin management has had it’s day and get someone else to run the company. We should have two strong competitors but we have one profitable carrier and one circus act. Pity because Virgin crew are pretty good and a lot of good people work there. Always thought Qantas and Air NZ are natural partners – they’re like an old couple, they break up for a few years and then get back together. Virgin and tiger are not cut out to even step up to mounting a challenge across the ditch . The way Tiger air treat its staff with pay and conditions is worrying tp day the least! With that why would virgin send them to NZ when they can’t even sort their own financial woes out!! Terrible news and it should not be allowed to go ahead. I would stay tuned to VA as when the codeshare stops they can make changes to every product offering streamlining international services ie food similar to what is offered on Long haul etc as they have not been able to make any changes,VA is the dark horse and frankly staff are a lot nicer then seen at QF or NZ.